The photographer was Stephen Meisler. Thanks to the efforts of stylists, Raquel Zimmerman received a completely natural makeup. Her natural beauty perfectly emphasized classic Dior jewelery. A bright make-up accent — bright red lips — made the very simple and exquisite Dior jewels even more attractive. In addition, one of the goals of the campaign was to emphasize the timeless nature of the collection. Apparently, the classic line of jewelry My Dior will always be relevant. Delicate bracelet and ring of yellow gold are made with luxurious weaving – gold curls will appeal to those who love the classic beauty of jewelry. 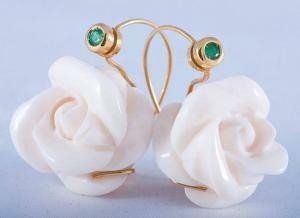 Design jewelry collection Dior engaged Victoire de Castellane. 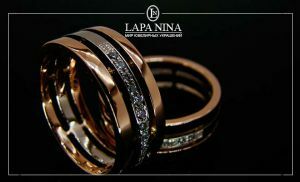 It includes bracelets and a ring not only of gold, but also with the addition of precious stones. My Dior diamond jewelery looks even more luxurious and expensive. For each version of the weaving of gold, a particular image of Raquel Zimmermann was thought out, which is why her make-up ideally combines with jewelry, presenting them very elegant, delicate and classic, while remaining bold and bright in its own way. 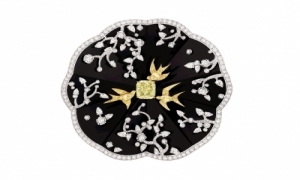 Victoire de Castellane this year marks the tenth anniversary of cooperation with the House of Dior. 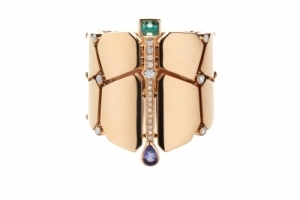 That is why he was so important in his new collection to demonstrate the richness of his jewelry skills. Thanks to his talent, the classic forms seem to come alive, filled with new energy and expressiveness.